You don’t have to have a million bucks to take a million dollar shot. Just because professional photographers have all sorts of high-tech and expensive equipment to help them with their craft doesn’t mean you have to. In fact, you can take great pictures – and save a lot of money – if you make some of your photography tools yourself. A light tent can easily be made with items found around your house. You can pretty much use anything translucent to make your light tent. Think outside the box and make your light tent out of a pillow case, a white lampshade, or even a clear storage container. In this example of a fast and easy way to make to a light tent at home we’ll be using normal, every day facial tissues. To minimize movement, start by setting up your camera on the tripod. Place the object you are photographing on a white sheet of paper; this gives the picture a neutral background and minimizes reflections. 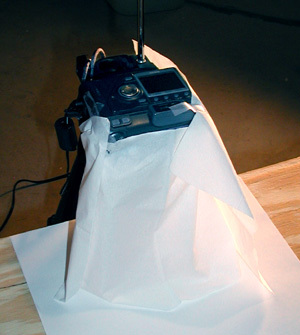 Situate your camera over the object and tape the tissues around the lens, forming a tent over the object. Obviously, since tissues are rather small your light tent will be short and you’ll have to be very close to the object you are photographing. This can cause blurry images with some cameras so be sure to experiment with a variety of translucent items and light tents.